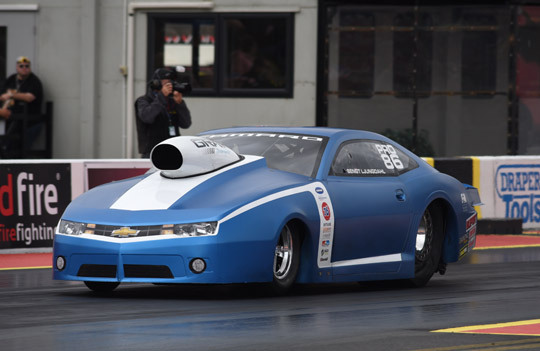 A blue Camaro will wear the number 1, but which blue Camaro? 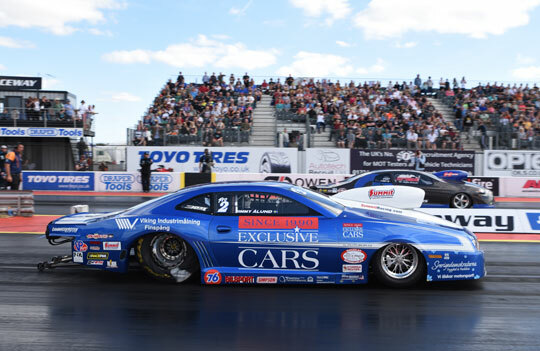 The 2016 Pro Stock season has certainly been a close fought race as we come into the finals at Santa Pod. Rain has affected a couple of the races this year resulting in cancellation of eliminations in Alastaro and reduced qualifying in Hockenheim and the first Tierp round. Points have been harder to come by for the main players. This has been the case across the board but we have still seen three winners before the finals. 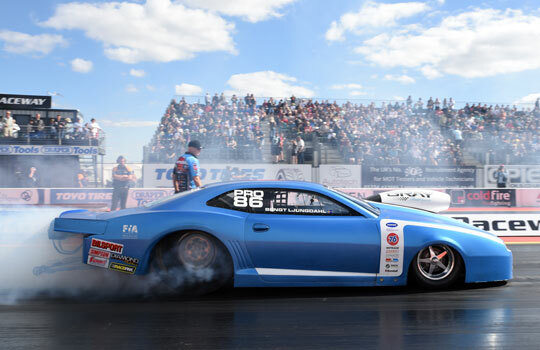 Jimmy Ålund won at Santa pod in May, Magnus Petersson took the honours in Tierp in June, Alastaro in July did not have any eliminations whilst Jimmy returned to the top step at Hockenheim. 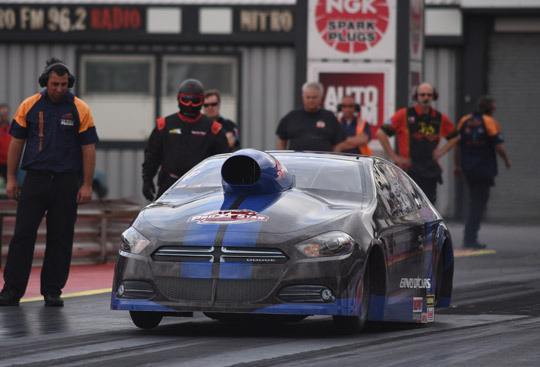 Bengt Ljungdahl took his first journey onto the top step in Tierp in August having been on the second step at the same track in May and at Hockenheim in August. Jimmy has been remaining stoically silent about his chances of a tenth championship and so he remained as he arrived in Santa Pod. Jimmy lead the championship by 37 points as the teams came to England for the finals. Bengt occupied the second place and was not going to be challenged by Magnus in third place. 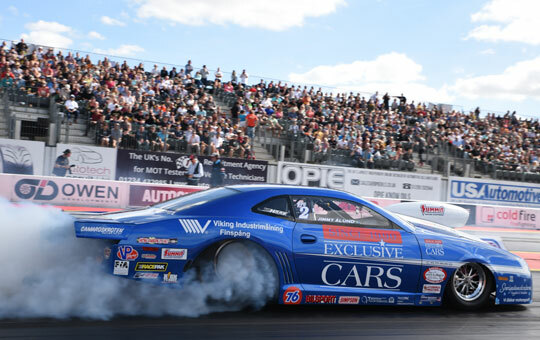 The late entry of Michael Malmgren sparked interest as a 5 car field would offer a third round of competition and increase the available points, however Michael withdrew his entry due to the engine damage he had suffered at the previous two rounds and so we were left with a four car field which would open eliminations at the semi-final stage. In order to catch and overtake Jimmy, Bengt would need to qualify number one in all sessions and Jimmy would need to falter at the first round. In Q1 Stefan Ernryd had some problems keeping the motor spinning as he went into burnout. A second attempt was also aborted and Stefan pushed back to the pits to re think the settings or trace whatever gremlin ailed him. Stefan later told me that it was a clutch problem linked to a driver issue. 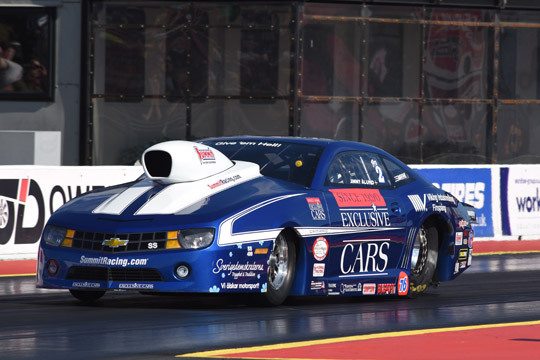 Pro Stock cars are incredibly complex to drive and operate and in his rookie season, Stefan had not found the best procedures and settings. Next car up was Magnus who delivered a solid 6.79 second lap without drama. The final pair were Bengt and Jimmy, both delivering 6.61 laps with Jimmy taking the number one qualifier position by 14 thousandths. Mark up one hurdle crossed for Jimmy. The issues that plagued Stefan in Q 1 were absent in Q2 as he completed burnout and delivered a reasonable, if a little off pace 7.58. Magnus improved his ET but not his qualifying position and remained third, Jimmy hit massive tyre shake and shut off while Bengt got down the track but failed to improve his position. 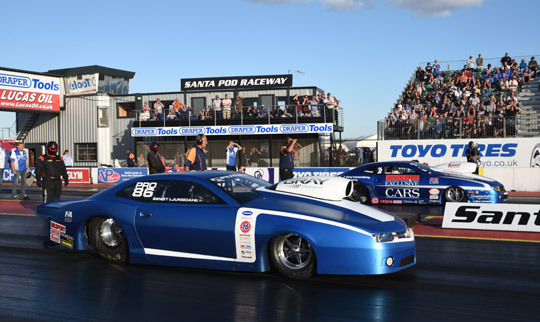 Saturday was rain affected all day and despite the best efforts of the Santa Pod crew, no racing took place. By the end of qualifying, Bengt had pulled back 2 points of his deficit to Jimmy, but this meant that if Jimmy went through round one, there would not be enough points remaining for Bengt to take the number one plate this year. Bengt took the first round with a stunning light and the better numbers all the way down the track, Magnus could only watch the Ljungdahl car pulling away from him and so Bengt would make another final. 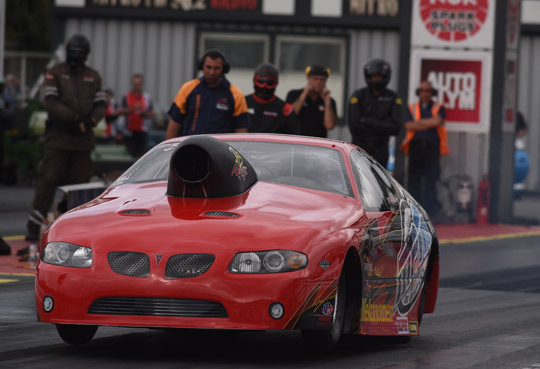 Stefan handed round one and a tenth European FIA Pro Stock title to Jimmy with a red light. Petter Grebhorn, Jimmy’s clutch wizard and a man of few words at the best of times turned to me and said “ten”, smiled, nodded and returned to the pit to prep the car for the final. 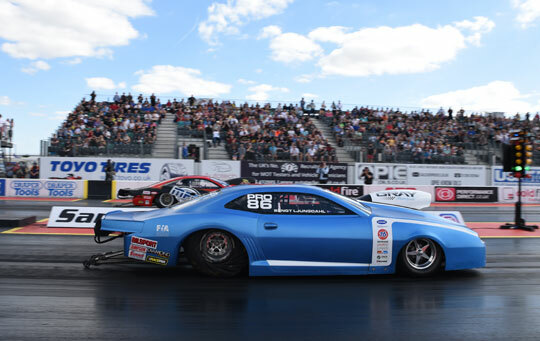 Pro Stock is in good shape for the 2017 season. Bengt and Jimmy have proven that they can run each other hard for race wins, Magnus too has proved that he has the racecraft to win events even against the awesome power the top two can bring to the party. Thomas will be back for a complete season, as will Michael and Stefan. We hope that at least one of the other new cars will make the full tour also and we look forward to the return of Simon Gustafsson. We are hoping to see 8 car fields at all events in 2017. 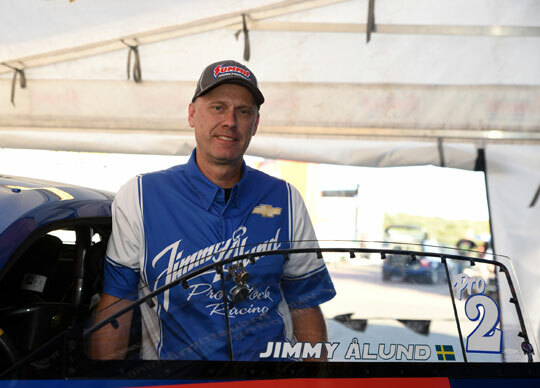 Huge congratulations must go to Jimmy Ålund and his team for wrapping up an unprecedented tenth FIA title. Bengt pushed him hard all the way and will want to take that title in 2017. Thomas will also want that number one back, and Michael would also like to regain the title he last won in 2010.